I was idly surfing a web link showing nostalgic old photos of computer equipment from as far back as the 1940s, and I was astonished to see a faded, dusty old photo of a device I recognized, the first computer graphics machine I ever used, the Vanguard Motion Analyzer. I remember seeing the Vanguard Motion Analyzer when I was just a little kid in junior high school, it must have been around 1970 or '71. I was in the math club and we were permitted to use the University of Iowa's timeshare computers. One of the local hackers liked me because a little kid like me was useful when we went dumpster diving for timeshare passwords, I could easily squeeze into the big dumpsters behind the computer center. We got into a lot of mischief together. My hacker buddy invited me to sneak into his workplace for a demonstration I would never forget. This visit would have to be a secret, because the job was a classified project for the Department of Defense. Nobody was supposed to know the University had contracts with the DoD, this was at the peak of student protests against the Vietnam War, the students would have a fit if they knew about his work. So one day after school, I rode my bicycle over to his office containing the Vanguard Motion Analyzer for a demonstration. The VMA is an incredible piece of analog computing technology. 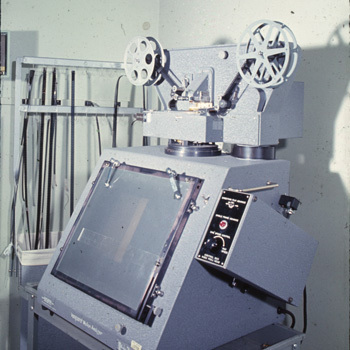 It is essentially a Movieola, a device for viewing 35mm films through a rear projection screen. But this is no ordinary Movieola, it has a clever arrangement of mirrors and prisms so the image can be precisely zoomed and rotated. It also has a special electromechanical film transport so the film can be moved back and forth, one frame at a time. There were two clips at the top of the screen to hold a sheet of translucent graph paper. A sliding clear plastic bar could be moved up and down the screen, to help align the image's horizon (or other reference points) perfectly level, for more accurate data plotting. Films could be played through the glass plate, viewed through the paper, and the operator would manually plot the position of objects on the graph paper. My friend's job was classified because he was plotting boresight films, high-speed 35mm films of artillery projectiles in flight. These films were used to calibrate new types of artillery guns or shells. A boresight film might record a tracer shell's flight taking a fraction of a second, but the film would last for many seconds if played at regular speed, and you could clearly see the projectile moving slowly across the screen. The film would advance one frame at a time, he'd plot the shell's position on the graph paper, advance another frame, plot another position, again and again. Then he'd input the plotted data on IBM punch cards. He let me plot a few data points, and it looked like the most tedious damn job I ever saw. But the high-speed films of flying artillery shells were absolutely fascinating, and perhaps for the first time, I got an idea of the mathematics behind the visual images of the world we see with our own eyes. If I had never seen this demonstration, I might never have ended up working in computer graphics. I can see the goals of the project more clearly, now that I've spent years working on computer graphics. The boresight films were probably taken from more than one point of view, and the computer was used for a "stereographic reconstruction," a way to calculate a 3D path through space from combining two 2D paths. The data was needed to calculate "artillery tables," to calibrate the gun so the gunner could accurately hit the target. Artillery tables are the reason the computer was invented in the first place. A unique table had to be calculated for every large-bore artillery gun, since they all had slightly different characteristics due to variations in manufacture. The tables were produced by an army of clerks, calculating manually with logarithm tables and slide rules, tediously working out the path for each type of shell, at every angle of elevation of degrees and even arc-seconds. But during the military buildup before World War II, artillery for ships was produced in such quantities that the clerks could not keep up with demand. Obviously an automated method of calculating the tables was needed, so a clever mathematician at Iowa State University, John Atanasoff, invented the first programmable digital computer. But when WWII started, Atanasoff abandoned his work and joined the Naval Ordinance Laboratory. Other major advancements in computing were directly inspired by artillery targeting problems. Battleships often used "artillery computers," which were massive mechanical analog computers with the artillery tables built in to the mechanism. Eventually, advanced models were developed to target moving ships. Other applications soon followed; Norbert Wiener developed methods of targeting moving aircraft with radar operated anti-aircraft artillery, using analog computers with feedback to continuously aim the gun ahead of the aircraft, as appropriate for the speed and height of the target. Weiner's new science of Cybernetics caused an explosion of new ideas, and lead the way to the modern computing age. But let's return to the Vietnam era and the Vanguard. Eventually, rumors about my friend's project leaked out, but were obviously misunderstood due to the incomprehensible technology. Rumors spread that the University had a secret contract with the CIA. Student protesters were up in arms, holding protests in front of the building, accusing the University of helping the Military-Industrial Complex to build killing machines. And they were right. So one night, the Weathermen went down to the office, and blew it up with dynamite, totally destroying the entire building. And that was the end of the project.